Green or sprouted potatoes – They contain a toxin called Solanine, which affects the nervous system (it’s bad for both birds and people). The leaves and stems also have the toxin, so try to keep them off of your potato plants. 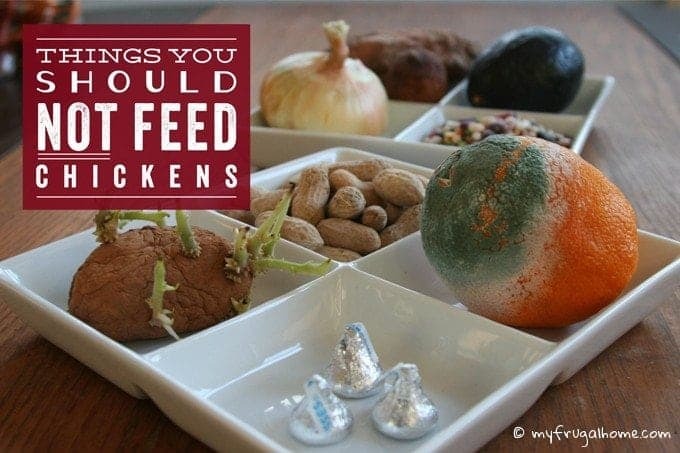 Sweet potatoes are a different matter all together, and can be given to your chickens without worry. Tomato, pepper and eggplant leaves As members of the nightshade family, they contain Solanine, just like potatoes, so you should try to keep your chickens off your plants. They can, however, eat tomatoes, peppers and eggplants. Avocadoes – The pits and skins contain the toxin Persin, which can be fatal to chickens. The fleshy part is safe to give them in moderation. Citrus Fruits – Some say it will slow egg production down; others say it can cause diarrhea; still others say it’s A-okay. Proceed at your own risk. Chocolate – It contains Theobromine, which is toxic to birds and many other pets. Dry/uncooked beans – Uncooked beans contain a toxin called Hemaglutin, which is bad news for birds and people, too. Raw eggs – Once your chickens discover how tasty eggs are, they may start eating them right out of their nest boxes. If you’d like to feed your chickens eggs (they are a great source of protein, after all), just scramble them first. Onions, chives and garlic – A little bit is fine, but if they eat too much, it may affect the flavor of their eggs; and it could cause them to develop Heinz Anemia. Rhubarb leaves– They contain Oxalic Acid, which can cause calcium deficiency. Prolonged exposure can lead to kidney failure. Really salty foods Some salt is okay, but too much can be deadly. Avoid giving them heavily-salted foods, and you should be fine. Rotten food – Feeding them over-ripe fruits and veggies is fine, but don’t give them anything that’s moldy or rotten. If you wouldn’t eat it, they shouldn’t eat it either. Raw meat – It can carry parasites and diseases. Some feel it can also lead to aggressive behavior and cannibalism in the flock. Processed foods – Junk food isn’t good for you, and it isn’t good for your feathered friends either. Greasy foods – They’re difficult for them to digest. Dairy – Chickens aren’t able to digest lactose, so it’s best to skip it. If you’re looking for a good calcium source for your chickens, try crushed up egg shells or oyster shells. Grass clipping and pulled weeds – Eating pieces that are too big can lead to an impacted crop, so it’s best to let them forage for themselves. Raw peanuts – As a member of the legume family, they contain a trypsin inhibitor (trypsin is an enzyme that the pancreas makes to help the intestines absorb protein). Because of this, raw peanuts are known to be bad for squirrels and other small animals, and some birds can’t eat them either. Opinions are mixed as to whether they’re okay for chickens. Some day we May be very thankfull for THIS knowkedge if our county ever is thrown back into the way past, and that verywell could happen. Keep up the good work! Thanks, Cindy. I’m glad you’re finding ideas that you can use. And good news: you can pin posts on the site. Just hover over any of the pictures in a post, and a “Pin Me” button will pop up. I’ll argue with your don’t feed chickens dairy, my flock has been getting cottage cheese and plain yogurt for months with no issues!!!!!! I also will supplement oyster shells but they thrive on the cottage cheese and plain yogurt. They also enjoy soft white bread!!! I have leftover shelled nuts from Christmas. 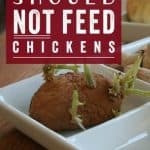 I want to know if I can feed them to the chickens without removing the shell? I’d shell or crush the nuts for them first. And you may want to steer clear of raw peanuts. They have a toxin that’s harmful to a lot of small animals. The jury’s out on whether they’re okay for chickens.